Multiple people inside the White House are vying to take over for Hope Hicks as communications director, while chief of staff John Kelly seeks potential candidates on the outside. The role is seen as particularly challenging because of President Donald Trump’s tendency to overstep is own advisers and throw rhetorical curveballs that frequently upend his administration’s messaging. Some people in the West Wing see Hicks, a close confidante of Trump and his longest-tenured aide, as irreplaceable. 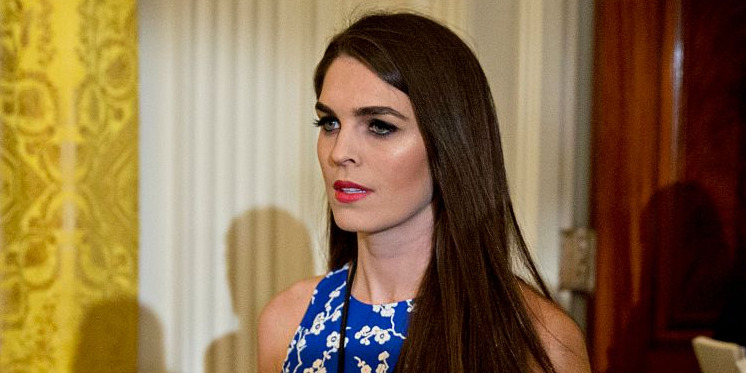 Multiple people in the West Wing are vying to replace Hope Hicks, the White House communications director who resigned last week. Current Trump administration staffers and some old associates of the president are among those being considered, while chief of staff John Kelly is looking for candidates outside the White House, Politico reported on Friday. The White House press secretary, Sarah Huckabee Sanders, is among the names being floated, as well as director of strategic communications Mercedes Schlapp, and Tony Sayegh, a public-affairs staffer at the Treasury Department. Both Schlapp and Sayegh have made known their interest in the job, the report said, adding that Schlapp is already a known quantity in the West Wing and a close ally of Kelly. Despite the buzz surrounding the search for Hicks’ replacement, some people in the White House reportedly believe she is irreplaceable. As a close confidante to President Donald Trump and his longest-tenured aide, the 29-year-old has developed a reputation for reading Trump better than anyone outside of his own family. Hicks had been reluctant to the job last year, Politico said, initially taking on the title of “interim” communications director. The role is seen as one of the most challenging in the Trump administration, due in part to the president’s mercurial nature and tendency to overstep is own advisers. Trump’s knack for throwing rhetorical curveballs that frequently send his press shop scrambling is part of the reason why the the job has seen such high turnover. On average, Trump’s communications directors have stayed in the job for fewer than 100 days, according to CNN – the shortest average for the role since it was created during the Nixon administration.